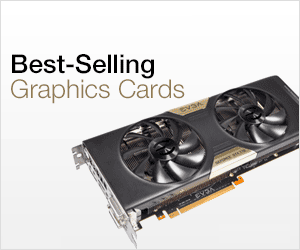 The rise in the value of cryptocurrencies has lead to the shortage of graphics cards online. Now even manufacturers are releasing their cryptocurrency variants of graphics cards that are tweaked to consume lesser power and for giving higher performance in mathematical calculations. But graphics card is only one part of the puzzle for mining cryptocurrencies like Ethereum, Zcash or other altcoins. This is because if you really want to rule the cryptocurrency arena then you do need a cryptocurrency motherboard that can support higher number of graphics card, has lower power consumption and has good stability. So here in this post I am going to list down the best Intel and AMD motherboards for cryptocurrency mining. Tip: Most Cryptocurrency Mining Motherboards have “BTC” written after the chipset type. BTC denotes Bitcoin. Here are the best Intel and AMD motherboards that you can use for building a cyptocurrency mining rig for mining Altcoins like Ethereum, Zcash etc. These motherboards will let you build a powerful GPU mining rig as all of them support six (or more ) graphics cards. 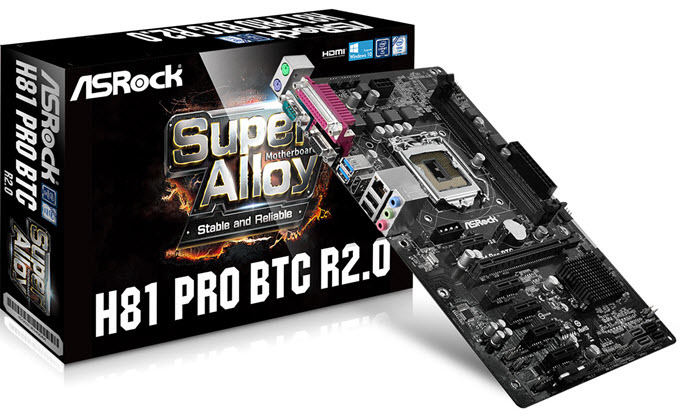 The first motherboard for cryptocurrency mining in our list is the ASRock H81 Pro BTC R2.0. This is a great mining motherboard that supports LGA Socket 1150 processors (Intel 4th Generation Haswell processors). This ATX motherboard is based on the Intel H81 chipset and can support up to 6 graphics cards. It has got one PCIe 2.0 x16 and five PCIe 2.0 x1slots for handling up to six graphics cards. This motherboard supports DDR3 RAM and has got 4 Power Phase Design for maximum stability. So if you are looking for an inexpensive motherboard for the purpose of building a budget cryptocurrency mining rig then this motherboard will not disappoint you. Biostar is a smaller brand but it is known for making some good budget motherboards. 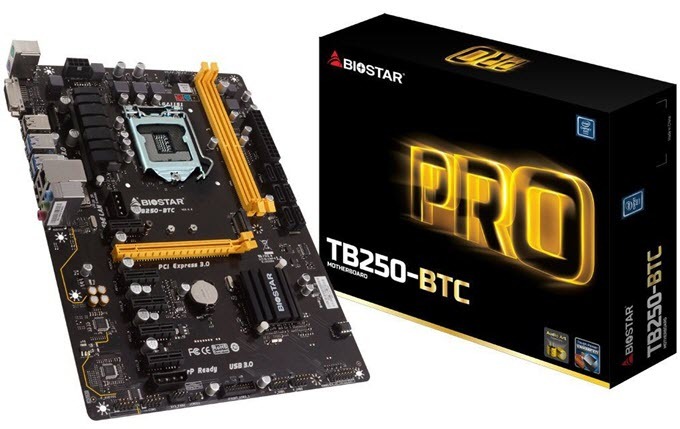 Here from we have Biostar TB250-BTC Ver. 6.x Motherboard which is another value for money mining motherboard. This is a Socket 1151 motherboard and supports Intel 6th generation Skylake and 7th generation Kaby Lake processors. 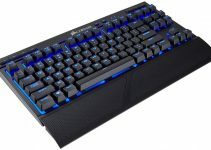 It is based on the Intel B250 chipset which is a budget mid-range chipset and it does not support overclocking. This mining motherboard comes with one PCIe 3.0 x16 and five PCIe 3.0 x 1 slot and can support 6 graphics card on it. The motherboard also comes with a M.2 slot for high speed M.2 Solid State Drives. 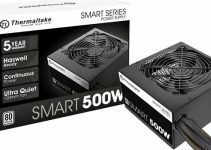 So if you are looking to building a mining system with the latest Skylake or Kaby lake processors then you cannot get anything better than this at an affordable price. 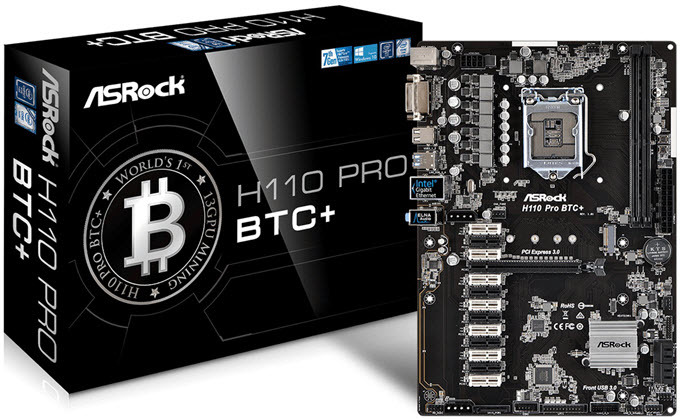 ASRock H110 Pro BTC+ can be called as the king of all the mining motherboards. This is because this motherboard can support 13 graphics cards for best cryptocurrency mining performance. It comes with one PCIe 3.0 x16 and twelve PCIe 2.0 x1 slots for graphics cards. This is a Socket 1151 motherboard and sypports latest Intel 6th Generation Skylake and 7th Generation Kaby Lake processors, DDR4 RAM and it also comes with M.2 Slot or Socket for high-speed M.2 SSD @ SATA 6Gb/s speed. This mining motherboard is based on the Intel H110 chipset and is super stable because of the 8 Power Phase design. It is a bit expensive than the other mining BTC motherboards in this list but if you want to build a powerful mining hardware and don’t have any budget issues then you should get this one only. This is a budget BTC motherboard for building an AMD Cryptocurrency Mining rig. 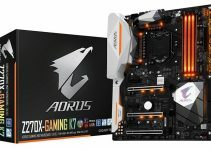 This is a Socket AM4 motherboard and supports latest AMD Ryzen and APU A-series processors. This AMD mining motherboard comes with one PCI-E x16 and five PCI-E x1 slots and supports total of 6 graphics cards. The motherboard is based on the AMD B350 chipset and supports overclocking. 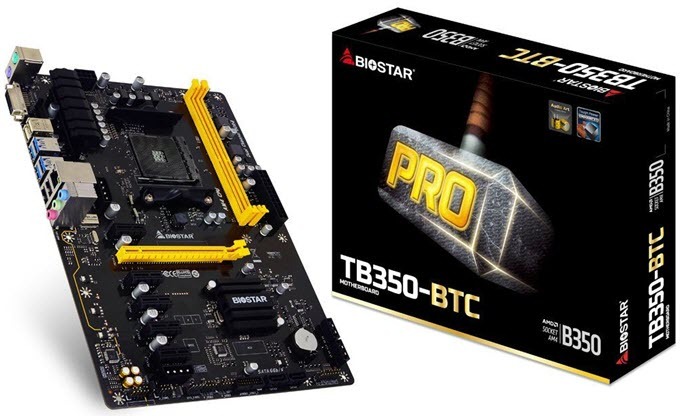 Biostar TB350-BTC motherboard supports dual channel DDR4 RAM and also got one M.2 Socket for the support of latest M.2 SSDs. So if you are looking to build an AMD Miner with the latest AMD processors then you should get this motherboard. So if are into cryptocurrency mining or looking to build a Intel or AMD mining rig then you can choose any of the above mentioned Intel or AMD motherboards based on your requirements or hardware you have. If you have any doubts regarding these motherboards then you can ask me your queries by leaving a comment below.